Another cool new feature in Orion is the Show Problems action. Available by right clicking on a file or folder in the navigation pane > Show Problems… This will run the validator on all of the selected content, displaying the entire list of of issues. The list can be filtered by text or source file and clicking on any problem will take you directly to the annotation. Potential problems in your CSS files are found using CSSLint 0.10.0. You can now configure the severity of each problem on the CSS settings page. 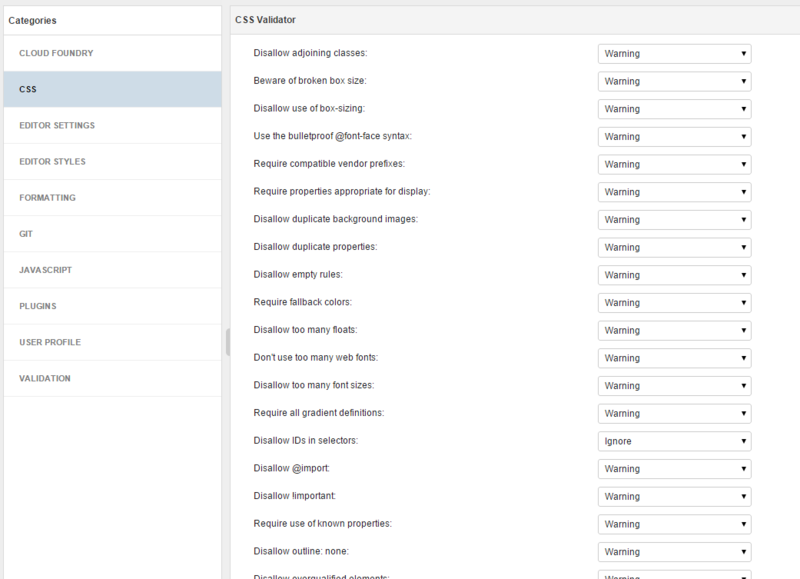 You can also configure the severity of problems in each file by adding a csslint embedded ruleset. There is also now content assist proposals to help you set the severity for specific rules. When hovering over problem annotations in the editor you may see links to resolve the issue. This is the new quickfix feature. Quickfixes provide one click solutions to fix problems in your code. There is no service API to provide quickfixes. Currently you must provide commands with a scopeID of ‘orion.edit.quickfix’. The commands will be rendered as links under problem annotations. In 9.0 we are looking into making quickfixes be contributed through a separate API. Quickly searching and navigating between source files is one of the major benefits of coding in an IDE over a simple text editor. Finding the file referenced in a Node.js or AMD Module dependency can be time consuming. Orion 8.0 has a number of improvements to make this much easier. We also provide a hover that will link to absolute and workspace relative paths, allowing one click access to your dependencies. This feature extends to the CSS and HTML tooling as well allowing you to swiftly move between associated files. If the tooling isn’t sure which file you are referring to, a list of potential files is displayed.